We found a problem in the previous releases of Tracker Dashboard which meant that alert emails with invalid ASCII characters might not be fully transmitted. Although not specifically a Tracker Dashboard issue (the problem relates to the way that email clients interpret certain ASCII characters) we have been able to find a workaround which is included in this release. Please contact the office as usual if you would like this update. 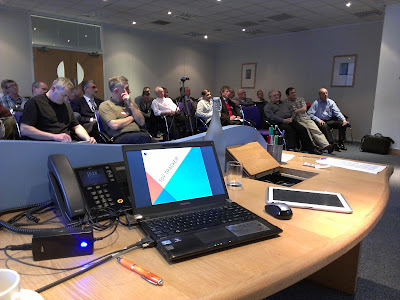 I've been presenting at Microsoft UK's HQ in Reading today for the Microsoft Access User Group. The topic of the presentation was how to package Access applications into saleable systems and I focussed on our successful "Toy Tracker" application (see www.toy-tracker.co.uk for more info). I travelled by train and had to battle floods around Oxford which meant that I was an hour later arriving and missed some of the Access 2013 presentation from Kevin Bell, Microsoft Seattle. Access 2013 looks interesting for "information users" who are wanting to create simple databases accessible over the web, but of less interest to Access developers building desktop apps. Looks nice though! I don't know if you've noticed our new-look web site at http://start-software.com? monitor work we are doing for you. Your existing "extranet" user ID and password should work - if it doesn't or you want a hand logging in, give Elaine a call on 0845 612 2402 or email support@start-software.co.uk as normal. This latest release of Tracker Dashboard has some bugs fixed and a nice new feature whereby you can now choose to group the information sent in the dashboard email tables by the first column of data. Please contact the office if you would like this update which is free to all customers with an active support plan. The team over at 7video have just created a video case study for us. The video showcases a bespoke order management system we've written for leading sportswear manufacturer Sportsjam using the Alpha Five development software from our US partners Alpha Software. We think the guys at 7video have done a great job. What do you think?! This new release of Resource Tracker has an important new feature when logging in plus an improved database consistency check process. In addition, the database consistency check feature (available through the File|Consistency Check menu option) will run more quickly and will not require users to present while the check takes place. Beta test customers can contact the office to request this update. Our Australian software partners CreativityCorp have just announced the following update which will be of immediate benefit to all Mobile Data Studio users running on Android smartphones and tablets, especially our Tracker Mobile users. 1. PRINT POINT is now supported to enable printing of HTML output from Mobile Data on Android devices. PrinterShare in combination with IO File Manager facilitates both printing of HTML and distribution via email and Dropbox. Setting defaults for PrinterShare and/or IO File Manager can streamline the process. 2. CAMERA POINT launches full function of inbuilt camera, with all controls and greatly improved user experience. Both smartphone and tablet cameras operate as we had always envisaged but required developments in Android APK to deliver. For use of camera images in the Sketch point it is best to use the ‘Lines’ option in Sketch point to wrap the image. 3. SESSION LIST COLUMNS are resizable by dragging on the column heading, columns manual adjustment can be reset back to zero by double tapping on the session column heading, user adjustments to sessions widths are saved and restored when the project is opened and closed, and tap to top of columns sorts sessions alphanumerically. 4. PROJECT UPDATE forced by TCP/IP is given effect if mobile user is within a session, on close of the session. 5. PROJECT FILE SIZE increase enabled, where previously project .ppc files of greater than about 3MB had poor performance on some Android devices. Such large projects containing images are now more likely to open and speed is improved. 6. LOGIC POINT outputs dynamic values, looks for "<%pointname%>" strings in the output value and does substitutions per Layout / Formatter points. This allows a Logic point expression to effectively ‘copy’ the value from one point to its output based on the condition of the logic. This will also be introduced for iOS and Windows Mobile. 7. ULTRADROP POINT filter is no longer case sensitive, consistent with Apple iOS and Windows Mobile. 8. GUIDANCE for points and pages now scrolls if the volume exceeds the Information box. 9. VERSION number is shown at bottom of Settings. We encourage the deployment of the upgrade to your customers. Before upgrading, it is prudent to move sessions off the mobile device to the Mobile Data Studio server. Office 2013 is soon to be released to the public and our Microsoft Partner status has given us early access so that we can check that Tracker and our other products are going to be compatible. The staff here at Start Software have given it a luke-warm reception so far but there are some nice features in it for sure. Also - it looks like Microsoft might be developing something for iOS (iPhones and iPads) as well as Android phones and tablets to allow Office docs to be viewed or edited... that might be interesting? I don't expect to see that being launched until Spring 2013 at the earliest. See http://www.gmanetwork.com/news/story/281676/scitech/technology/ms-office-for-ios-android-due-march-2013 for more info. Best keyboard for Android smartphones? I was reminded about "Swype" the other day by a magazine article listing the top 10 downloads for Android devices. Swype lets you enter text onto an Android smartphone much faster than typing by letting you run your finger to trace each word on the keyboard. It doesn't sound fast but it is! Blindingly quick and very clever too as you can be really inaccurate and it always seems to guess the right word. Really worth a go if you do a lot of data entry on your phone (so especially good for Tracker Mobile users). One of the benefits of having an office on Wolverhampton University's Telford Campus is that we have access to their research projects and some exciting new technology. Lots of our systems can benefit from this technology - our asbestos consultancy clients running Tracker, for example, have opportunities to use QR codes and RFID tags when labelling asbestos. Another one of our clients, SMC, runs a warehouse control system which we created for them some time ago and they see immediate uses for the technology. We've just implemented a very cool feature in a customer management and order processing system we built last year for a growing sportswear supplier - Sportsjam. They use QuickBooks as their accounts package and have been creating invoices by hand once orders are fulfilled... but the system we wrote for them has all of the information it needs to post the invoice. So could we do that automatically to save some admin time? Using a QuickBooks add-in called QODBC we changed our Alpha Five written system to automatically create an invoice in QuickBooks on the press of a button. Can we do the same for you? Do you use QuickBooks as your accounts package and have a system written in Alpha Five or Microsoft Access that you'd like to link to QuickBooks in this way? Perhaps automatically post invoices or other data? Perhaps read information from QuickBooks (eg customer balances) and display them in your Alpha Five or Microsoft Access system? Contact us for advice and to discuss your requirements.